Stern Shore Ties | Have More Fun. Get Boativated! Shore tying. Some anchorages are crowded, narrow, or steep and deep right close to shore. We have anchored in places where the depth under the keel was 20′ and the depth under the rudder was just 8′. Sometimes, dropping the anchor and backing up to tie a line ashore is necessary. It limits your swinging and can also keep your bow pointed into a prevailing wind. Tying to the shore when anchored on a sloping bottom will pull your anchor up the slope and help keep it from dislodging. Shore tying is an acquired skill. It takes patience and practice. The skipper needs to be attentive and alert. THE MOST IMPORTANT THINGS TO REMEMBER ARE TO HAVE EVERYTHING READY BEFORE YOU START, TO PROCEED CALMLY, AND COMMUNICATE CLEARLY. THE WORST SHORE TIE MISTAKES ARE ALWAYS THE RESULT OF HURRYING OR GETTING TOO EXCITED. IF YOU HAVE THE OPPORTUNITY, IT IS USEFUL TO PRACTICE SHORE TYING IN AN AREA WHERE IT IS EASY. ALSO, BEFORE YOU TRY SHORE TYING YOU MUST KNOW HOW TO ANCHOR CORRECTLY. The following is a summary of our usual shore tie procedures. Sometimes we have to vary the procedure to suit conditions. It’s a constant learning process. Our process won’t work for everyone or in all situations so you need to develop your own techniques. Don’t get discouraged. It gets easier the more you do it. 1. We carry line for shore tying on the stern. It is mounted so as to feed out freely to someone taking a dinghy ashore. We use 600′ of 1/2″ floating line. 2. The polypropelene line will be run from the stern of the boat to the shore, around a tree or other secure object on shore (some marine parks have metal rings or chains anchored into rocks) and brought back to the boat. This makes it easy to leave without going ashore. 3. When we enter the anchorage we motor slowly along the shore watching the depth, keeping track of wind and current, and looking for a good place to secure the line ashore. 4. When we see a place to tie ashore we both look it over and discuss if it will work. Be sure there is an easy place to land the dinghy and climb ashore. Don’t send your crew up a cliff or running over slippery rocks. 5. Communicate carefully about going ashore with the stern line. Be sure everyone understands the plan and agrees. If not, work it out before proceeding. 6. We have our dinghy launched and ready before we drop the anchor. It helps if the person going ashore is wearing gloves and shoes that can get wet. Don’t send someone ashore barefoot or in thongs. He or she may need to scramble. There may be barnacles, oysters, sharp rocks, or slippery seaweed. 7. Once we spot a good place to tie ashore I turn our boat away from the shore and move slowly ahead perpendicular to shore. When we are sufficient distance away to allow for proper anchoring scope (accounting for the depth and slope of the bottom and space to back up) we drop and secure our anchor. We back down to set the anchor and then let out enough chain and rode to allow backing toward the shore. 9. Mary rows toward the shore while I slowly back up. Here’s where wind, current, or prop walk can make it tough. You must go back-up as straight as possible. You must have enough slack anchor chain or road to allow backing up. 10. This is where floating line is essential. If the line doesn’t float it will be difficult to get ashore, especially by rowing. It works best to have the line come freely off a spool. If you try and coil the line into the dinghy first and then go to shore it will almost surely become a tangled mess. 11. While Mary is going ashore I try to keep the boat perpendicular to the shore. This can be tough if there is wind or current or if you have a lot of “prop walk” that pulls the boat sideways. You will learn how best to do this over time. Be sure you do not drag your anchor loose while backing up. 13. If we are satisfied with things Mary takes the end of the line and runs it around the designated tree, stump, ring, etc. If necessary, she can again secure the line and take another rest while I re-align the boat to perpendicular. 14. If we are still satisfied Mary begins pulling the line around the tree or through the ring. This is easier than trying to pull line around a tree or through a loop while rowing back. Coil the line carefully and put it into the dinghy so it’s not a mess. You should be close to shore so the trip back should go quickly. 15. Once the end of our shore line is back aboard the boat I tie the stern line at two cleats, one cleat for each end. I watch how the boat swings and how far from shore we are. I check the depth and the time and tide. I figure out how deep and shallow it will get and I adjust the distance from shore to suit the conditions. From time to time you may need to adjust your distance from shore to suit the depth. 16. When shore tied you will still swing back and forth if there is wind or current abeam. Your shore line will slide back and forth around the tree or through the ring and the boat can actually move quite a distance. If you are near a rock, reef, bar, or other obstuction on either side of your boat there can be trouble. 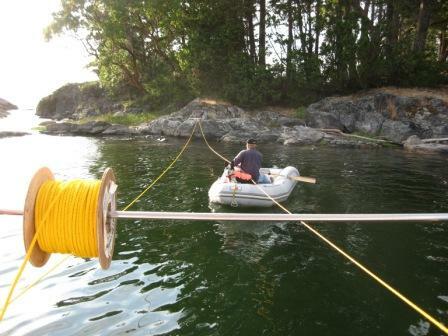 One solution is to run another line ashore and tie it tight to prevent much lateral movement. When it comes time to leave, this secondary line can be untied and brought back aboard first.